Ok, so there are no dingos in The Gambia. And I don’t have a baby. But there are a number of wild animals in The Gambia. After the heat, wild animals are my next biggest concern related to my 430km run across The Gambia beginning July 7. 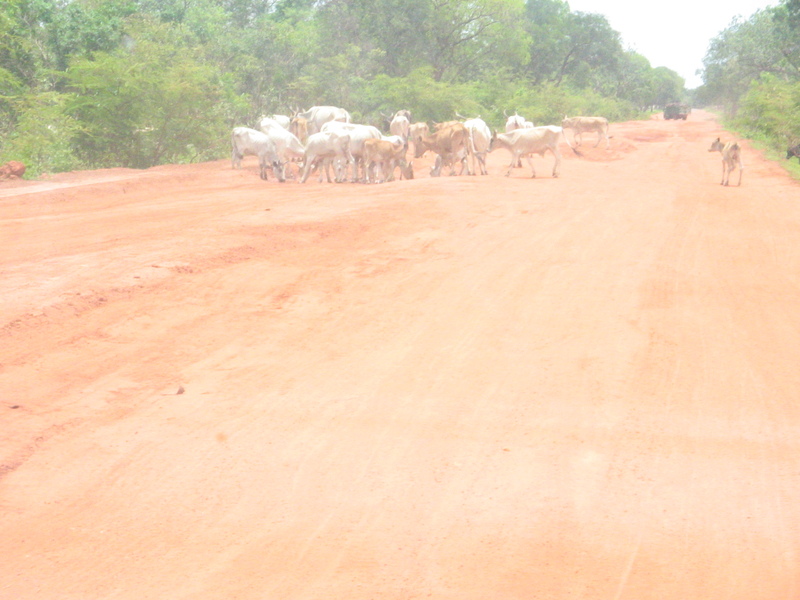 The South Bank Road, about 200km from Banjul. The Gambian River runs down the center of the country and there is exactly one road above the river and one below. I’ll be running along the South Bank Road, below the river. My support vehicle will be driving ahead 4-6km and waiting for me to catch up. No idling is important to me. The South Bank Road is rural, especially “upcountry” where my run will begin. It’s territory owned by animals. Hippos, goats, cows, monkeys, lizards, large cats. Case in point here in this photo: a road block crafted by cows. Like many, I loved these animals as a kid. I still admire their beauty. I understand people who want to go on safari. But I don’t want to lay eyes a single one of them in July. I don’t do well with animal surprises while running. This summer, Candice, Debbie and I were running in Kejimkujik National Park, single file on a narrow forest trail. I was in the lead. A deer popped up in front of me and I swear my heart stopped for 3 beats. I froze. My flesh suddenly turned to ice. My girlfriends collided with my motionless form. Not a big deal, the deer was more afraid of me and it ran away. If I pull this frozen statue trick in The Gambia, I pretty much become hippo bait. There were news reports of hippos and bush pigs destroying farmers’ crops along the Gambia River this winter. In 26 different villages. Click here for that story. I saw one hippo in Zimbabwe in 1999. I’ve never seen a hippo in The Gambia, and would like to keep it that way. So please, hippos, leave white running girl alone. Go back the river, there’ll be nothing to see on the South Bank Road this July. Monkeys- perhaps the cutest of all rabies-vessels. 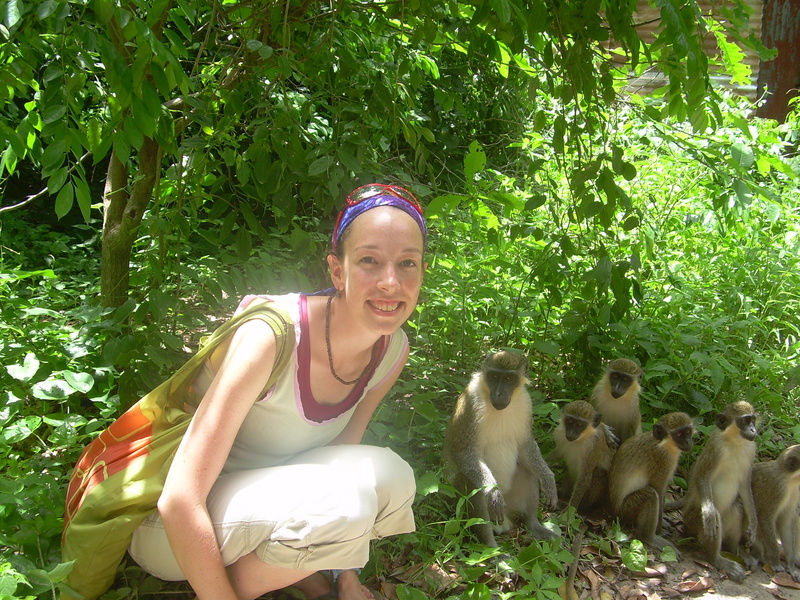 With an enduring image of a monkey jumping on Ashley’s back in 2007, I’ve been considering getting the rabies vaccine. Until I learned that it’s very expensive. Like $230 per dose and you need 3 doses expensive. Training partner McKim has offered to take me to the vet with his dog Bailey where it’s cheaper. He figures I weigh about 25 lbs more than Bailey, it could work. Always looking out for me, that McKim! There's a cold pool of fear under my smile. Mel Connors and I didn’t know each other before traveling to The Gambia. 48 hours after we met, we arrived in our bedroom in Fajara, where there was one double bed. Snuggled together under the same mosquito net, our friendship blossomed. However, despite our strong bond, I once left her for dead. By accident. We were walking down a path. A snake shot out from a bush and slithered speedily towards my sandaled feet. My fight or flight response kicked in immediately. I ran far, far away, as fast as I could. It was crazy. I didn’t even think, I just ran. And I left Mel with the snake. I didn’t even warn her… I don’t deal with surprise animals. 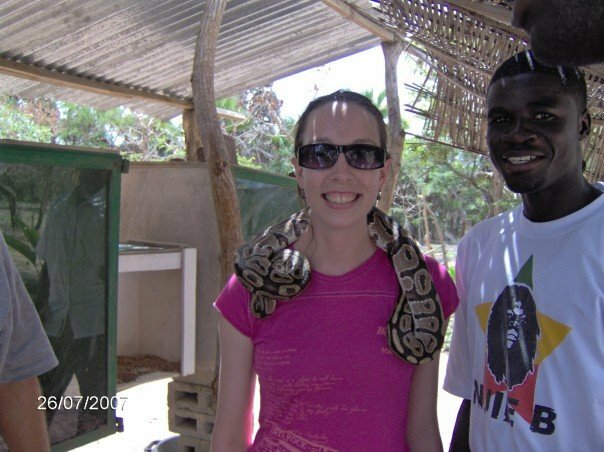 I could barely deal with this snake around my neck. The snake owner took it away from me as soon as this photo was snapped because my anxiety was stressing out the snake. And I was crushing my friend Pa Modou’s hand. He was probably as happy as the snake to be out of this situation! What kind of snake is this? I don’t even know- a scary one. 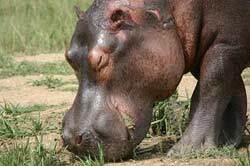 Hippos kill more humans than any other animal on the continent of Africa. But in my opinion, this is the scariest of all animals: the Nile Monitor Lizard. It’s basically a crocodile the size of a large dog with fast moving legs, a long tail and strong jaws. It’s a day time animal that hangs around more in the rainy season. Oh, and it’s a carnivore, nice. I witnessed this monitor lizard bomb out of a bush in a monkey park. Of course, I didn’t take this photo, Ashley did. I was trying not to pee my pants. God I hope I don’t pee my short shorts while running on the road to Banjul. Imperative to this goal: don’t see any monitor lizards. My palms are sweaty as I write this. You’ll have to read your own information about the monitor lizard here. So like the heat, there’s not much I can actually do to prepare for animal sightings. 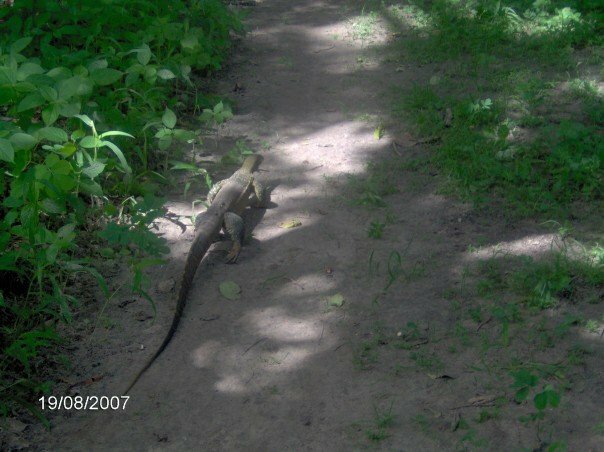 Unless, I suppose, some of my running partners start surprising me on our runs by jumping out of a hiding spot and yelling “monitor lizard!” So as it is, animal sightings will happen. I’ll get through. I’ll arrive at the Atlantic Ocean in Banjul. I’ll raise lots of money to keep kids alive through HIV and malaria education. This entry was posted in African Safari, running and tagged Africa, hippo, monitor lizard, monkey, running, snake, The Gambia. Bookmark the permalink. 4 Responses to A Dingo Ate My Baby! Ok my 1st thought here (to be honest) is shock….Hippo’s kill people! I wont go as far to admit im naive and possibly under-educated on the animal kingdom, but Hippos! I always thought they were slow and shy. Shame on you disney for giving me a false sense of security around Hippo’s. Second thought…..I think the rabies vaccine would be a good thing. In honor of what you’re doing can someone not donate the money to pay for these or can public health not give you a break and do it for free. I dont think you will have any unfortunate adventure with animals and I certianly will be praying you dont but (my attempt at humor here) you dont exactly have a perfect track record when it comes to animals. I vivedly remember a certian incident with a reindeer once!!! Come on, Melissa, you had to throw the “reindeer incident” out there! 🙂 Point well taken. I hear you about animals jumping out at you. Not a life/death thing when running here and I only had to ever dodge one snake when in Ontario and I didn’t run then and I had an uncle with me with a large stick to “remove” it…….. I hope you don’t have any animal sightings while you are running in Gambia. Or if you do they are too busy drinking/sleeping etc to bother with the gazelle “Erin” as she runs past…….